Welcome to the Mu Chi Chapter of the Sigma Nu Fraternity at Lynchburg College! Sigma Nu takes extreme pride in being the only fraternity in existence to be founded on the principle of Honor and more importantly, our firm standing against hazing. In 1869, our three founders at the Virginia Military Institute decided to create an organization that promoted Brotherhood and growth to become a better man. In lieu of hazing, we make sure that we develop the importance of leadership, ethics, respect, and academics. Sigma Nu Fraternity puts academics first; the main reason as to why your son is in college. The Mu Chi chapter has continually maintained the highest grade point average out of all of the fraternities found on campus. Our new members almost always see a rise in their grades once they begin their process with Sigma Nu. Mu Chi ensures that academics is a priority and we make sure all members are above our mandatory grade point average. Brotherhood is an aspect of Greek Life that the Mu Chi chapter exemplifies. While browsing our website, you may have come across pictures that only touch the surface of how strong our bonds are. We do not exist as a social club, but as a strong group of men whose friendships and ties will not break once your son graduates. Our alumni are always in communication with the chapter and often visit for special events hosted by the collegiate brothers. Sigma Nu offers an educational system which sets us apart from other fraternities; the LEAD program. The award winning LEAD program helps by developing ethical leadership. LEAD allows our members to gain the knowledge and skills that will allow your son to be an effective and ethical leader in life. LEAD begins during your sons new membership candidacy, and continues on throughout their college career. While I could go on about this fantastic organization, I strongly encourage you, as parents, to ask about Sigma Nu. The Mu Chi Chapter of Sigma Nu overcomes the “fratboy” stereotype by replacing it with fraternal success, growth as an individual, and academic success. Sigma Nu is an academy for your son to become a man. We are a fraternity for men, not boys. If you have any questions about Sigma Nu or the Mu Chi Chapter of Lynchburg College, do not hesitate to contact me at bowles_d@students.lynchburg.edu. DJ is a junior International Relations major with a minor in History at Lynchburg College. He also serves as a Connection Leader (3rd year), Connection Leader Coordinator (2nd year), and Vice-President of PACE (Peer Advocates for Campus Education). Before becoming Commander, he served as the Recruitment Chairman and is the Rho Class 1st. Corporal. 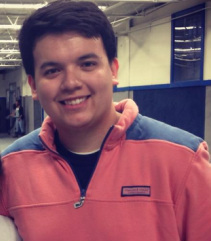 He joined Sigma Nu in the fall of his sophomore year.